A fence could be an excellent addition to your backyard! A fence could be exactly what your property needs. Many homeowners are not exactly sure if a fence is right for them or even worth the investment. A well-constructed fence can improve the appearance of your property, as well as provide privacy and security. 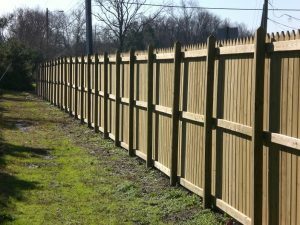 If you are unsure if your property needs a fence, consider the following. Noisy neighbors are the worst! Are you tired of your next door neighbors being able to see practically everything you are doing at home? A fence is an excellent way to put an end to that. There are all sorts of tall privacy fences available for your consideration. You should be able to live in the comfort of your home without having to worry if someone is watching you. One of the main reasons why people install fences is to improve the security of their property. Burglars are far less likely to target homes with fences around them. If security is a primary reason why you are debating getting a fence for your yard, consider one of the many durable security fences available today. It is next to impossible to keep an eye on your children and pets every second of every day. A well-constructed fence should prevent your children and pets from ever escaping from your yard. Many dog owners have fenced-in yards so they can let their dogs run around in the yard without needing to be on a leash. Did you know that a wood fence can significantly reduce the amount of noise you will hear from inside your home? If you live in a busy area like the city or near a major roadway, you probably have to listen with a fair amount of street traffic from inside your home. A fence could be a great way to reduce the level of noise you hear on a daily basis. This entry was posted on Friday, December 15th, 2017 at 5:04 pm. Both comments and pings are currently closed.